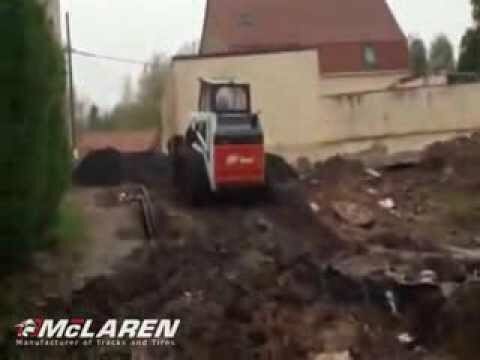 for your skid steer loader! It bites into any surface! 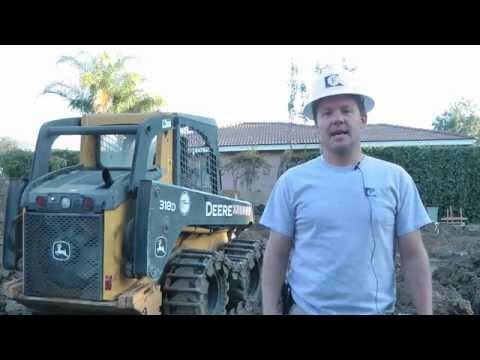 Skid steer loaders offer excellent portability and performance in tight situations. They are ideal for digging, lifting and other tasks in construction, landscaping, mining and many other heavy industries. For many businesses, a well-maintained, functional skidder is critical to their ability to get the job done, as well as to their overall productivity. However, many skid steers tend to struggle in rough terrain. Adding on a set of over-the-tire tracks can make a skid steer more versatile, expanding the capabilities of your fleet without an investment in new equipment. McLaren Industries manufactures rubber tracks that install quickly over a set of tires, effectively giving you a single machine that can do the work of both a skid steer and track loader. 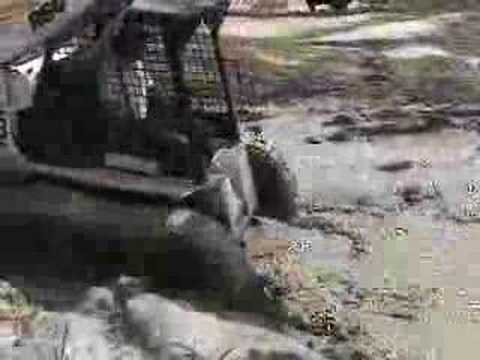 Over-the-tire tracks are a smart upgrade for any skid steer loader. Our products offer industry-leading floatation, traction and overall performance at a low operating cost. They are easy to maintain and feature replaceable rubber pads that make them fully rebuildable for added value. Together, these benefits are good for your business and great for your bottom line. Designed for the most demanding job sites, but safe for use on asphalt, driveways, gardens and lawns, McLaren Industries' OTT™ skid steer tracks are perfect for any situation in which a standard skid steer loader wouldn't be suitable. 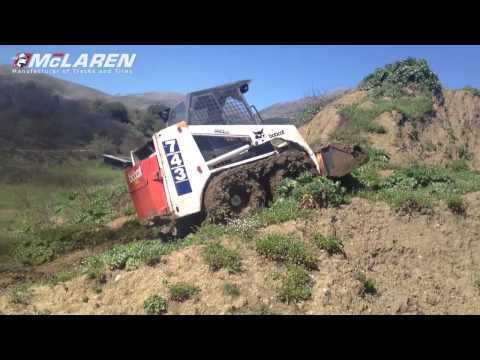 - McLaren RUBBER OTT tracks: Our most versatile product. We manufacture these tracks from high-grade manganese-enriched steel for the base and heat-treated, chromium-enriched steel for the pins and links — a combination that offers excellent performance and protection for your tires, both on-road and off. Our RUBBER OTT tracks fit on any pneumatic or semi-pneumatic 10x16.5 or 12x16.5 tire set and are available with optional non-marking orange rubber pads. - McLaren MAGNUM OTT tracks: Our heaviest-duty option. MAGNUM tracks feature specially designed all-steel shoes for added protection when working in demolition, waste processing sites and other harsh environments. A directional tread design offers better traction in loose ground conditions, while the same rubber padding found on the RUBBER series delivers improved floatation for operator comfort. MAGNUM OTT skid steer tracks fit on top of either 10x16.5 or 12x16.5 tires. - McLaren DIAMOND OTT: Our high-traction track. Use them in wet, muddy and graded conditions where additional 'bite' is required. An open-face tread design allows for optimal clean out, reducing maintenance requirements while minimizing wear and tear. DIAMOND OTT tracks fit over 10x.16.5, 12x16.5 and 14x17.5 skid steer tires. - Maximizer™ OTT: Our cost-effective, budget-friendly option. The Maximizer series is known for incredible value and performance at an affordable price point. Maximizer tracks borrow many of the advanced design features of the Diamond OTT product line, but they are engineered for lighter duty or part-time use. Use Maximizer OTT skid steer tracks on top of 10x16.5, 12x16.5 or 14x17.5 tires. Purchase your tracks individually or, for maximum performance, alongside a set of McLaren Industries' solid rubber skid steer tires. Request your quote today or give us a call at (800) 836-0040 for more information about our over the tire skid steer tracks. 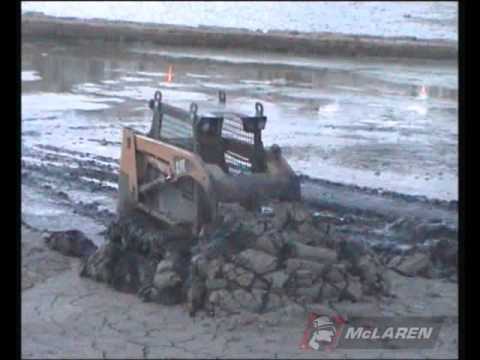 The McLaren RUBBER OTT™ tracks are the most versatile skid steer tracks available. We use only high-grade, manganese-enriched steel for the base of the track and heat-treated, chromium-enriched steel for the pins and links. The replaceable rubber pads are made of highly durable, wear resistant rubber compounds with a steel attachment plate embedded within. This combination makes the track sections virtually impenetrable, greatly reducing the chances of down time due to flats. McLaren RUBBER OTT™ is designed to give you the ability to use your machine on asphalt, concrete and lawns without causing the damage created by steel tracks. They are also designed to excel off-road, giving you excellent flotation as well as traction in wet and sloppy conditions. Also available with non-marking orange pads - no black marks on concrete! McLaren Rubber OTT is a perfect system for landscaping and jobs in urban areas. The rubber shoes protect turf and pavement and thus reduce damage to roads, sidewalks, driveways, gardens and lawns. Non-marking orange rubber pads available are available for McLaren Rubber and McLaren Magnum OTT. Combine with McLaren's Nu-Air Tires to get the maximum performance from your skid steer loader! 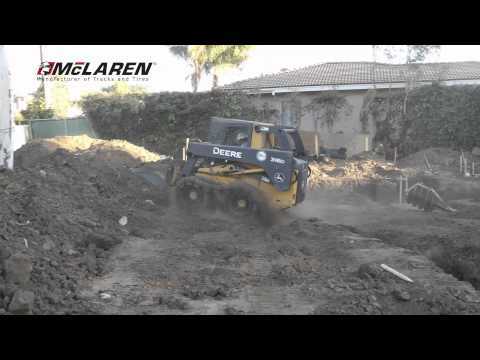 The McLaren MAGNUM OTT™ tracks are the toughest skid loader tracks on the market. Using the same base track as the McLaren RUBBER OTT™, these tracks also produce excellent floatation. The virtually indestructible all-steel shoes are designed to stand up to the most demanding environments while offering the best tire protection. With their directional design, the McLaren MAGNUM OTT™ shoes give you the extra pushing and pulling power (traction) needed while working in sand, mud and loose rock. The McLaren DIAMOND OTT™ tracks are the best solution for conditions that demand greater traction. The diamond-shaped bar surface creates more traction than the smooth bar design of other tracks. The angled edges really dig in to prevent slippage on wet grass, in mud and especially when working on hills or side slopes. The open face style allows for optimal clean out which is extremely important when working in snow and icy conditions. Our McLaren DIAMOND OTT™ tracks bite into the ground like no other over-the-tire tracks can. The McLaren Diamond pattern bites into mud, clay, loose rock and sand. 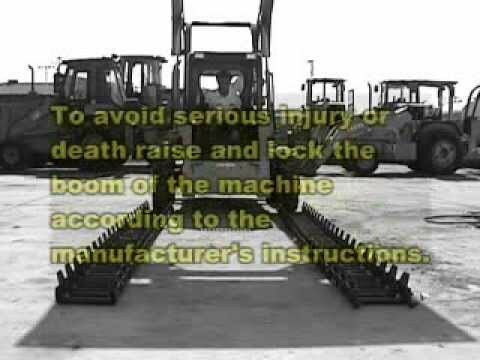 This is our skid loader track recommendation for working on snow and ice. The Maximizer™ OTT tracks are the cost effective way to have an OTT track system. It is basically a lighter version of our heavy duty McLaren Diamond OTT™. Although they are designed for part time usage, the Maximizer™ OTT tracks are made of the same steel alloys as our other McLaren OTT tracks. The hexagon pattern on the bars digs in just like the diamond pattern and will prevent slippage on slopes and in wet or icy conditions. They will give you the traction you need when tires alone won’t do the job. Unbeatable price for a high performance over-the-tire track system.